– Recycling will not be picked up until next week. 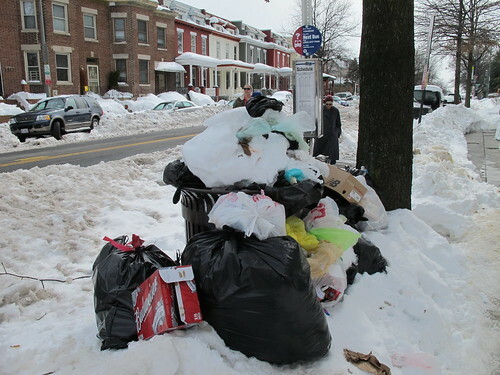 Trash Collections: Trash will not be collected Presidents Day, Monday, February 15. Collections in once-a-week collection neighborhoods will “slide” to the next day. For example, Monday trash collections will be made Tuesday, Tuesday collections will be made Wednesday, and so on. In neighborhoods with twice-weekly trash collections, Monday and Thursday collections will be made Tuesday and Friday, and Tuesday and Friday collections will be made Wednesday and Saturday. The alleys remain impassable because about three feet of snow fell between Friday, February 5, and Wednesday, February 10, so DPW asks residents to put their trash in dark plastic bags and place them at the curb no earlier than 6:30 pm the night before collection and removed from public space by 8 pm on the day(s) of collection. Bleach may be added to the bags to repel rodents. Recycling Collections: Recycling collections will be suspended this week and residents are asked to hold onto their recyclables until the following week. Bulk Collections: Bulk collections scheduled for Tuesday, February 16, through Friday, February 19, will be rescheduled. DPW bulk collection drivers continue on snow duty.